This post is the second in a series on energetic cross-training. In the first post, we focused on how yoga and mediation are intimately linked. In this post, we focus on how yoga and moving practices can be linked. In the third post I talk about how everything fits together. Most people in the west just know about hatha yoga—very few are aware that China actually had an entire Yoga system. As Indian hatha yoga was classically a bridge to meditation, Taoist yoga or what we call Longevity Breathing Yoga, was a preliminary practice for other Taoist energy arts, including qigong, the three internal martial arts of tai chi, bagua and hsing-i, as well as Taoist meditation. 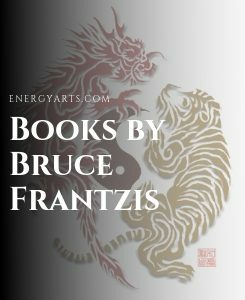 What Taoist energy practice you started to learn or ended with was often determined by the teachers that were around you and your own interest in a subject. 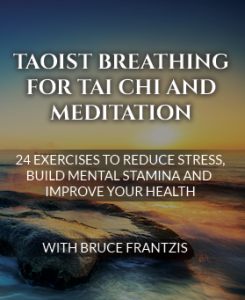 What makes Longevity Breathing Yoga unique – or any of the Taoist energy arts for that matter – is the incorporation of the 16 neigong (internal energy techniques) into the movements and postures. Most teachers and masters of tai chi rarely teach the 16 neigong in the West, either because the students are not ready or because they were never taught the complete system themselves. I’ll write more posts about the neigong later because it is at the core of all energy arts and the concept of cross-training. 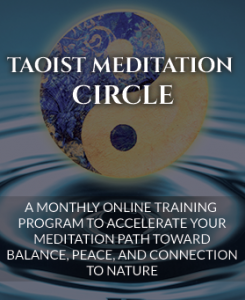 In this post, let’s connect many of the Taoist movement forms. The main function of many Taoist movement forms such as tai chi and qigong (chi gung, chi kung) is really to get your mind fully conscious in your body. You can see how this would be really beneficial as you move deeply into meditation. You can actually experience your mind or your body as something outside of you. This is like looking at your body as something on the bookshelf or the desk. You can have the experience of either having your mind look at your body from the outside or you can be conscious of the body from being inside of it. Now with Longevity Breathing Yoga (Taoist Yoga) the whole thing moves you towards experiencing your body from the inside of it, each part and the whole, not like you are looking from the outside perspective as an observer, which is how a lot of people go through life. This is especially true of our highly caffeinated society with the immense amount of mental work we are required to do. It keeps us in our heads and many times not feeling our body. So, Longevity Breathing Yoga is all about dropping the energy of the mind back into the body. And this then sets a foundation where the mind gets more and more still. As you progress further the mind is then able to deeply penetrate your body. This happens layer by layer. This sets the stage for the ability for your mind to start experiencing the depth of ‘what is in your mind’, the two go together. The access point and key is the body. You have to ask yourself can you be fully in your body and if so, how long can you stay there without gapping out? In this respect, qigong and Longevity Breathing Yoga are not really that different. If you are going to be more accurate this was the same purpose of why the Taoist developed qigong. The only difference is that most of qigong practices are standing or done moving. Qigong has many of the same exact goals. The nice thing about Longevity Breathing Yoga is because you’re not moving as fast it is easier to actually feel and go inside your body. For a lot of people simultaneously moving and the paying attention to what’s inside of them is just too difficult. 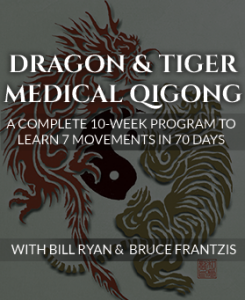 So, in qigong, you have to do two things at once and that’s not so simple. 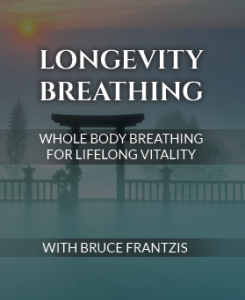 If you were having difficulty staying inside and feeling your body while you were doing a moving practice such as qigong or tai chi, you might want to learn a bit of Longevity Breathing Yoga, because that might enable you to develop the sensitivity required. With Longevity Breathing Yoga at least once you get in a posture all your doing is focusing on what’s inside you—you are only doing one thing. Many people find that Longevity Breathing Yoga to discovering and feeling their internal landscape. Again everything is connected. Both tai chi and bagua perform the same function that it really allows a persons mind to enter their body—you are making your body conscious. When you practice tai chi and bagua, once you have been at it for a while, it is possible to use the mind to enter the deeper emotional physic and karmic states. This is an important step, one that is reached by few because they can not pull this off while doing the movements. Most are focused on doing the external movement correctly and are not able to go inside because it is simply too much to concentrate at one time. The movements and alignments have to become second nature so that you can move toward this point. 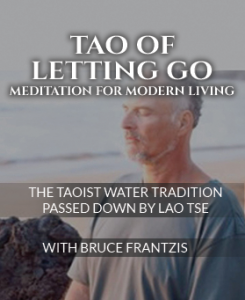 So, one option is to first learn how to go into the mind in another practice such as Longevity Breathing Yoga and then separately learn a qigong, bagua or tai chi practice. Then, once you have it together separately, then you put the two things together in one. Combine and separate is a common principle in learning tai chi and any other movement form (you can apply this principle to many western sports such as swimming or golf for that matter). Let me take this from another point of view from energy cross-training. In China, there are also qigong methods that are primarily taught sitting. You sit, and through sitting you learn how to have all the chi (qi) move inside your body without you moving at all. Well, sitting qigong was also used as a prime practice or as an adjunct practice to doing tai chi and bagua because then you would take that stuff that you were doing in sitting qigong and you would do it moving or vice versa. 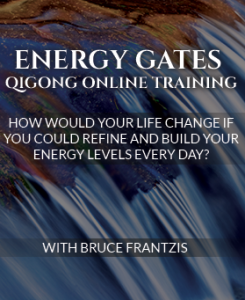 Then, your sitting qigong practice would then flow into your tai chi and bagua—this is energetic cross-training. 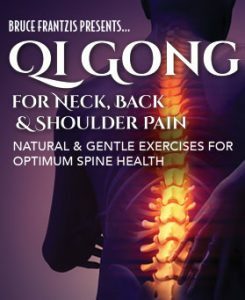 The sitting practices would enable you also to have a much clearer understanding of how you could do all of this qigong or tai chi work when you were just sitting. So, everything is intertwined. However, depending on your goal and intent, there may be an easy way to learn something and a hard way. All of this is learning to move toward mastery in whatever practice you are doing. Please click here for Part 1 in this series, and here for Part 3.
http://www.youtube.com/watch?v=5O1NgfVIpQU seems to be the clip you are looking for, it is not presently linked in this article. Thanks for the site, and all the other work of BKF and crew. I use his Wu form and am impressed.